Preparing my remarks now for a discussion in Seattle on March 12 with noted historians Roger Daniels and Barbara Takei on a topic that still opens wounds today. Register for free here. As we’ve written before, the goal of the Eji Suyama, 100th Battalion/442nd RCT Draftees, No-Nos, Draft Resisters and Renunciants Archival Collection Endowment at UCLA is to preserve the history of the entire range of dissidence and resistance to the wartime incarceration of Japanese Americans. The project is coming to Seattle for Roger and Barbara to preview their much-anticipated new book on Tule Lake and the notorious Segregation Center, while I will talk about the life of novelist John Okada, author of the foundational novel, No-No Boy, and how he drew upon the story of the draft resisters and set it against the places he grew up in here in postwar Seattle. Read more in the Suyama Project news release. I’ll share new research and insights into the life of Okada, and some of the inspirations that went into his work. Successfully adapting any work to the stage presents a challenge. The fact that it isn’t easy doesn’t justify violating the author’s intent. In response to our commentary about the slapping of a happy ending on the staged version of No-No Boy that is still being pitched for a national tour by the Pan Asian Repertory Theater of New York, dramatist Ken Narasaki acknowledges in a recent Discover Nikkei blog that he couldn’t find a way to make the original ending work onstage. He also says we cannot criticize his ending without having seen the script. 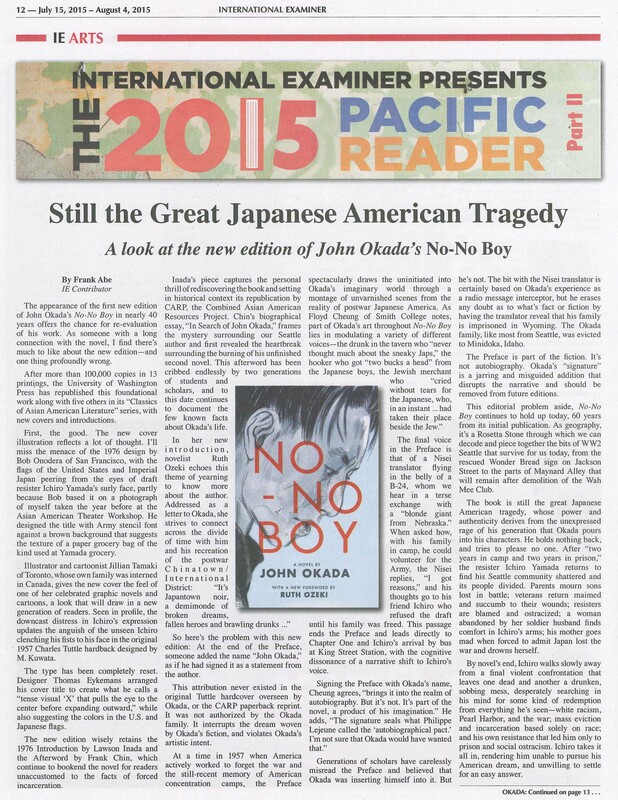 John Okada’s No-No Boy is the great Japanese American tragedy. 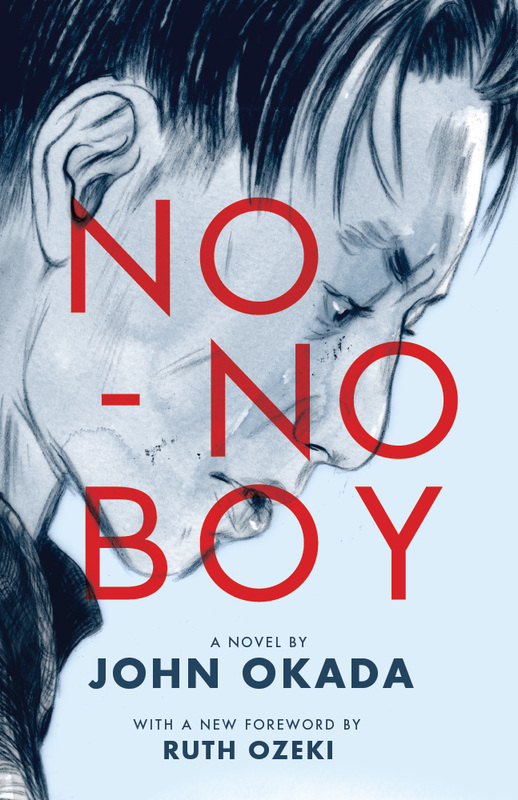 Much of its power stems from its open-ended conclusion that sends draft resister Ichiro Yamada into the darkness of postwar Japanese America, searching for answers not just for himself but for all those in his world. The last scene of this stage adaptation reduces Okada’s epic vision to sentiment and schmaltz, so as to leave the audience with a comfortable feeling of tidy resolution, complete with callbacks to isolated lines from earlier in the novel to support an outcome never intended by Okada. Ichiro and Emi dance, slowly, close together. ICHIRO: I don’t know. I was … enjoying this, you know? And then, a funny thought came into my head. ICHIRO: Nobody’s looking twice at us. ICHIRO: Yeah. I know. They’re livin’. EMI: You know, there’s something about this place. ICHIRO: There’s something here, huh? What is it? He kisses Emi. She kisses him. The sight of Ichiro and Emi dancing occurs four-fifths of the way into the novel. Through the character of Emi, Okada suggests the chance for Ichiro of love and salvation. Emi is lonely and frustrated in her marriage, and takes Ichiro as a lover. Okada then frees up her marital status by having her absent husband ask for a divorce. Emi expresses a wish for Ichiro to take her dancing, and he impulsively takes her to a roadhouse south of Seattle. That’s the scene above. But here’s the rub: Okada places this second romantic interlude 40 pages and two chapters from the end of Ichiro’s journey. Through his brilliant organization of the material, Okada states clearly his artistic intent. He refuses the idea of a happy ending for Ichiro. Emi and Ichiro go dancing, but it’s not enough to redeem the young resister. Newly released from “two years in camp and two years in prison,” Ichiro is far from ready to pursue his American dream. He needs time to sort out who he is and where he stands in the rearranged and distorted new landscape for Japanese America through which he has just passed. Love itself cannot cure all. As Ichiro might say, “the problem is bigger,” and with his ending Okada makes it clear it is something that Itchy will have to fight through for years to come. Bringing Ma back from the dead to encourage Ichiro to “hold your head high” twists her words from their original meaning and changes her character. The line is from an early scene in which she recites from memory a letter from a fellow fanatic who relays news that Japan won the war, exhorting followers to “hold their heads high” in this delusion. Repeating it at the end as Ichiro and Emi cling to each other makes Ma appear approving or forgiving. She was neither; she killed herself because she was incapable of approval or forgiveness. It is not a question of staging the original ending as written on the page; it’s a question of what you do to create “an entirely new solution” for ending the play on stage. The problem here is not the artistic difficulty of adaptation; it’s a problem of the artistic integrity of the result. “… audiences usually desire, if not require, some sense of resolution. In this case, knowing what we know now, I think it’s possible to end this play on a note of hope, rather than despair… How much change is sacrilege? How much change constitutes a desecration?